DO YOU SING IN THE SHOWER? HUM ALONG WITH THE RADIO IN YOUR CAR? SING HAPPY BIRTHDAY FROM TIME TO TIME? If you answered “Yes” to any of those questions, you qualify! Please consider joining us for Family of Christ’s Choir. If you are interested, please talk to Jon Bock either at church or by phone at (813) 838-4426. Please leave a message. Someone asked the other day exactly how many bells our church owned. The church currently has 37 bells. That means there are nearly ten bells that never get played in church, so we need your help! Please consider meeting with us once a week to help praise our Lord with music. There is no experience required. We can even teach you to read the music. It’s not as hard as it seems, we promise! While we do work hard, we have a lot of fun, too. We meet at 6:30pm on Wednesday evenings for dinner and then start practice at 7pm. We practice for about an hour each week in order to play about once a month for services. If you have questions, please ask Jon Bock either at church or by phone at (813) 838-4426. Please leave a message. We’d love to have you come be a part of the praise band. Worship is an important part of every Christian’s life. The music in worship holds a special place. It has a unique way of touching the hearts of the worshipers and giving them a way to express their love, sorrow, praise, joy, need, thanks, and so much more. At Family of Christ we have both traditional and contemporary services. 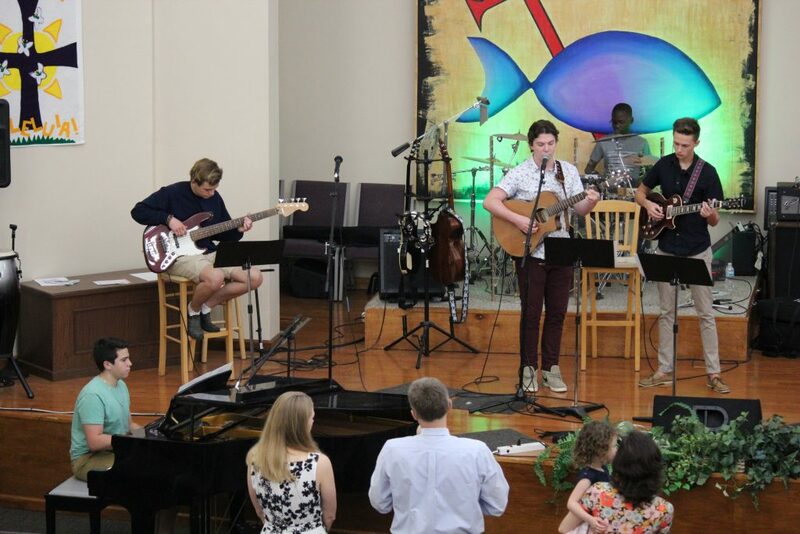 The praise band plays an important role in the worship of the contemporary service…and we have a great time doing it. We are always looking for musicians who want to use their God-given musical talents to help enhance the worship experience of those who come to the contemporary service. For more information or to join the band, please contact Leanne Ferguson at 813-558-9343.